The Volkswagen TDI Sportwagen due to hit US showrooms sometime soon has everything a car enthusiast could want in a wagon package: manual, diesel, available AWD (although not all three together). The problem is it's not really a "performance" car. Here's the solution. 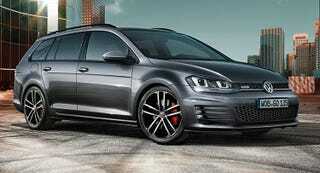 The Golf GTD Variant (fancy word for wagon) is due to be revealed at the Geneva Auto Show. It will have everything you like about the MK7 Sportwagen, but instead of having only 150 hp and 240 ft/lbs of torque, the two-liter TDI motor is boosted to 181 hp and 280 ft/ lbs. That should be good for a 7.9 second sprint to 60. Keep in mind that VW claims a 0-60 time of 6.5 seconds for the GTI and most of the tests are putting the hot-hatch under 6 seconds, so the GTD wagon could be a bit quicker than advertised. The GTD will also be outfitted with a 15 mm lowered "sports" suspension, progressive steering, GTD specific bumpers and radiator grille with honeycomb structure, smoked taillights and sill extensions, 17-inch "Curitiba" alloys, black roof rails and chrome-plated twin tailpipes. Inside you will find: "Clark" cloth upholstery, illuminated door sills, black headliner and black pillar trim, "Checkered Black" decorative inserts, multi-function leather steering wheel with aluminum trim, gear knob in the shape of a golf ball and aluminum pedals. The one downside to the Variant is that the extra size and weight make it slightly less fuel efficient, but just look at it! Pricing for the GTD Variant would put it about $36,124, or about the same as a Golf R. As of now, VW has no plans to bring the GTD Sportwagen to America, but considering that the uber-expensive Golf R400 is still on the table for US sale we may have a small chance in getting the GTD.